I had to write and tell you how much I love my Ice Red mesh bags. I purchased them last year, based on a colleague’s recommendation. They have been my constant companion from the time I opened the box. I tell everyone about Ice Red Bags and how wonderful they are. I can change purses and remained organized. I think they are great! Recently, I was writing with a pen and couldn’t figure out how red ink ended up on my hands (the pen was black). I remembered that I had a red pen in my bag and checked to see if it was leaking. Sure enough, the pen had leaked. Fortunately, I had all of my pens, highlighters, and pencils in one of my Ice Red Bags. The ink was contained inside the bag, keeping all of my other valuables, including my other Ice Red Bags, protected. I was able to clean most of the red ink out of my bag. I was thrilled that the ink did not leak out to the inside of my backpack, because it is cloth and would have been ruined. Thanks for giving me one more reason to love my Ice Red Bags! This is a deep and fairly roomy bag that still looks stylish for work. It fits two 1&1/2 inch binder notebooks and a decent sized laptop. 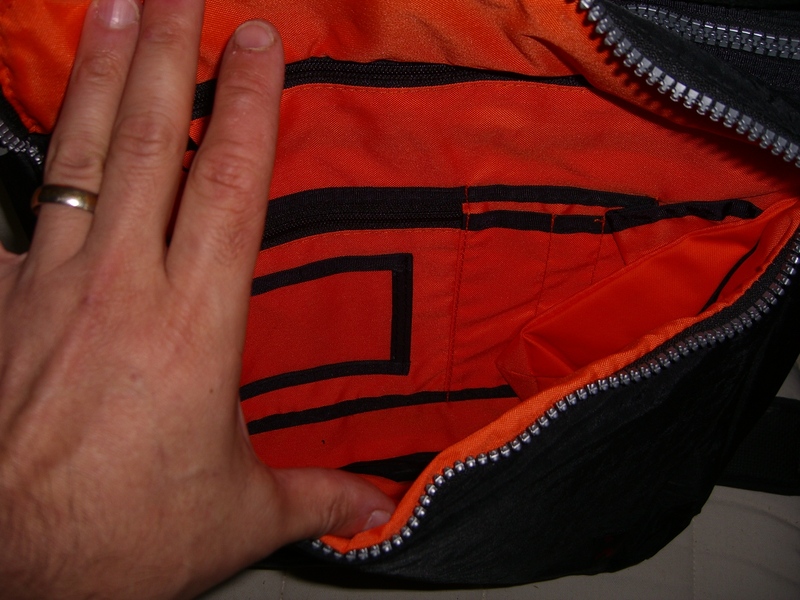 The two smaller outside pockets are very useful. The larger ones could have a little more room built in but at least you have one on each side. It has a zipper so you can increase the width but I think it could have been a little more, also it only increases at the bottom which sometimes makes it difficult to pull something out. The inside pockets offer a lot of storage if you don’t have too much work to carry around, otherwise they are almost impossible to get to without emptying the bag. That’s usually ok because that’s what I do anyway when I get to my destination. You’re out of luck if it’s stuffed and you need to get something while in transit. I suggest using one of the small outside pockets for anything you need to get to then, like your wallet. It’s still the best laptop bag I’ve purchased and I love the color combination of lime green and orange. Excellent choice for those with ADHD as I can take what I need in one bag, instead of a smaller laptop bag and a work bag. The bright color makes it less likely to leave at home or at work. The material is very sturdy, I think this one will keep me satisfied for quite a while. This bag has been wonderful to use while traveling. I use it as a carry-on and can fit my 15.4″ laptop along with other books and paperwork in the main part of the bag and then some snacks and water in the front pouches. It works great and is very stylish!